So, in the interests of turning my personal obsession into a public service like the Girl Scouts trained me to do (just “do[ing] a good turn daily,” ma’am), here is Part I of my series on Girl Scout handbooks, past and present. More serious collectors will want to refer to Mary Degenhardt and Judith Kirsch’s Girl Scout Collector’s Guide, ISBN 0896725464 (Texas Tech UP, 2005). 1912: The Guide’s Promise. The Guide’s Promise was the booklet that brought Girl Scouting to the United States. This first handbook was a 16-page pamphlet published by Juliette Gordon Low on March 8, 1912. Only 40 were made (they were intended to be temporary), and I have no idea whether any still exist. I have never seen one. 1913: How Girls Can Help. The Baden-Powells wrote and Low published How Girls Can Help on April 9, 1913; it was also a pamphlet of sixteen pages that described some of the basics of Scouting (taken from Boy Scouting) and the requirements for a few proficiency badges. The first handbook was published later that year. 1913: How Girls Can Help Their Country. On the left: the sixth printing of How Girls Can Help Their Country, 1917. On the right: the Applewood Books reprint of the 1913 guide. Click for full size. How Girls Can Help Their Country, the joint work of Low and Savannah, GA naturalist Walter J. Hoxie, was printed in 1913. The original was a hardcover, clothbound book containing 147 pages. The Girl Scout Collector’s Guide lists this as the “first edition” and another printing that same year as the “second edition,” though I questions whether the “second edition” was really a second edition or just a second printing of the first edition. At any rate, the second-whatever was limited to 500 copies. The third edition, dated 1916, contained 151 pages and ran to 5,000 copies; the fourth, also dated 1916, was 156 pages (the last two were an equipment sales pamphlet. Edition/printings five, six, and seven all came out in 1917 and contained 154 pages. The one on the left in the photograph above is a sixth edition, printed in 1917, with the price (thirty cents) listed on the cover. The right-hand one is the recent reprint by Applewood Books: not worth anything as a collector’s item, but much easier to read than the original, whose pages have turned a fine dark brown, being pretty cheap to begin with. 1918: Scouting for Girls. A hardbound book covered in khaki cloth and published by Juliette Gordon Low in 1918 and re-released in 1920. The 1920 printing is the best-known; 50,000 were published. Sources disagree on how many of the 1918 version were published and whether or not any still exist. This book split the program into Brownie Scouts, Scouts, and Senior Scouts depending on age. A special Officer’s Edition (marked “Officer’s Edition” on the cover) was also available. Originally printed in England, this book was used by several U.S. Brownie Scout leaders until books could be written for them on this side of the pond. The book explains the name thus: “the alternative name of ‘Bluebirds’ was suggested as that of ‘Brownie’ might be incongruous in some parts of the Empire.” Indeed. In 1921, Josephine Daskam Bacon finished Brownie Book, A Manual for Leaders of Junior Girl Scouts, for leaders who wished to begin Brownie Scout programs. However, The Brown Book for Brown Owls is widely considered the first “official” Brownie Scout leader’s guide in the U.S. Five editions in eight print runs were released between 1926 and 1930. They had paper covers. In 1937, the Brownie Packet, a mimeographed update, became available. 1927: Scouting for Girls, Changes in Badges, and The Lone Girl Scout Trailmaker. An abridged edition of the 1920 handbook, mostly to take out the war-related information. I suppose by 1927, people were desperately bored with the Great War. From 1927 to 1932, Changes in Badges, a pamphlet updating badge requirements, was issued each year (with two separate versions released in 1928). The Lone Girl Scout Trailmaker, a 40-page booklet for Girl Scouts without troops, was also released in 1927, and The Lone Girl Scout Adventurer was released in 1928. 1929: The Girl Scout Handbook. When people refer to “the first Girl Scout handbook,” you may need to ask them whether they mean the first handbook or the first Handbook, since the title The Girl Scout Handbook wasn’t used until 1929. The new Handbook was a whopping 464 pages long, including a brand-new section on mapmaking. According to Degenhardt and Kirsch, it was available in either a hard- or soft-bound edition. 1933: The Girl Scout Handbook. I own the second impression of this book, published in 1934, but mine flatly refused to photograph. So here is an image of the same book, courtesy of etsy.com (click to visit seller’s Etsy site). The 1933 Girl Scout Handbook, in hardcover. The first edition of the 1933 Handbook could be purchased either in a cloth binding with black lettering, as pictured here, or a soft leatherette binding with gold lettering. The soft ones could also have the owner’s name embossed on the cover (far more elegant than the Sharpie on the handbooks I used as a Scout!). This book went through four impressions, the last being printed in February 1938. An additional booklet, Girl Scout Proficiency Badge Requirements and Special Awards, was printed in 1934, since the 1933 Handbook had no badge requirements listed in it. The 1933 Handbook is the first one that was available in both Braille and large print, for vision-impaired Scouts: the American Red Cross provided the Braille version, and the National Society for the Prevention of Blindness provided the large-print one. 1938: Girl Scout Program Activities, Ranks, and Badges. This book provided the requirements for the all-new “Intermediate Girl Scout,” ages 10-14. The booklet listed the various activities under ten different program fields (and we thought the five Worlds were exhaustive!). Three editions were printed, the last consisting of a relatively small 50,000 copies. The leaders’ version, Intermediate Program Guide for Girl Scout Leaders, was published in 1939. 1940: Girl Scout Handbook. The revised and updated handbook for Intermediate Girl Scouts, badge requirements included. Written by Edith Conant and illustrated by Barbara Danielsen. This book went through nine impressions between 1940 and 1946, publishing between 101,000 and 200,000 copies each time. In October 1943, Leadership of Girl Scout Troops, for Intermediate program leaders, was published. It was also written by Edith Conant, but with the help of Martha Jane Smith and illustrated by Catherine C. Lewis. A 24-page Supplement to the leaders’ guide came out in 1949. Ms. Conant and Ms. Smith would continue to play a role in the authoring of Girl Scout handbooks and related materials for several years to come. My copy of the Leaders’ Guide to the Brownie Scout Program. Mine is a 1950 hardcover edition; those printed in 1939 and 1945 had soft covers of a different design. So, really, this isn’t the book we’re talking about at all. This book was, in essence, The Brown Book for Brown Owls and the Brownie Packet united under one cover, with added information on “Units of Interest” for Brownies. The first two editions of this book were printed in 1939, and bear the title A Leader’s Guide to the Brownie Program; the “A” was dropped in the 1945 and later editions. The book was revised in 1950 and again in 1957, where it was given the hard cover pictured above. 1947: Girl Scout Handbook. My personal favorite, the first one I ever officially “collected,” and one of the two handbooks of which I own multiple copies (with the 1986 Junior handbook, which is the one I used as a Junior Girl Scout). In person, these two handbooks look as if they’re printed in slightly different colours: the one on the left in silver, the one on the right in gold. The difference is especially pronounced along the spines, where the dark green is noticeably darker on the one on the right. I suspect, however, this has more to do with age than anything else – the left-hand one is a fourth impression, printed in 1949, and the one on the right is an eleventh impression, released in 1952. This Girl Scout Handbook was a completely revised edition, written by Margaret Chapman and Marie Gaudette, with illustrations by Jessie Gillespie Willing and a brand-new color plate featuring the Girl Scout Promise and Law, designed by Vera Bock. The badge requirements were arranged alphabetically for the first time and included the first appearance of the “Agriculture” program. Like the 1933 handbook, this one was also available in Braille, this time from the American Printing House for the Blind. A pamphlet on New Ranks and Badges in the Intermediate Program was also released in 1947. 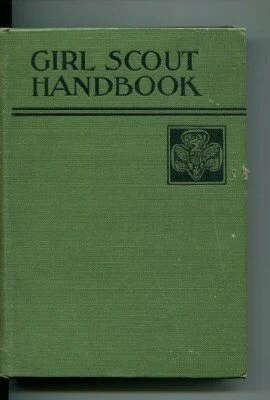 It contained the badge and rank changes included in the 1947 handbook and was designed for girls who were still using the 1940 handbook. In 1949, the Supplement to Leadership of Girl Scout Troops was released to bring leaders still using the 1943 leadership guide up to date. The new leaders’ guide was published in 1950. ….37 years into Girl Scouting, and we’re just getting started. Stay tuned for Part II. I have a 1938 revised copy of girl scouts program activities ranks and badges. How valuable is it? Hello, I have the First Impression, October, 1933 Copy of the Girl Scouts Handbook in very good condition along with a Kutmaster Utica, N.Y. green pocket knife. Could you tell me the value? My email is NBSB10@SBCGlobal.net. Thank you! I have a GIRL SCOUT HANDBOOK INTERMEDIATE PROGRAM , Catalog No. 20-101 $1.00. Could you tell me the value? My email is: 4Gkids@windstream.net. My name is Barb. thanks. I HAVE A COPY OF THE THE GIRL SCOUT HANDBOOK COPYRIGHT 1933; BY THE GIRL SCOUTS,INC ; NEW EDITION; FIRST IMPRESSION OCTOBER 1933 THAT LOOKS LIKE THE PHOTO YOU HAVE ABOVE. IT IS IN VERY VERY GOOD CONDITION WITH ONLY THE NAME OF THE OWNER NEATLY WRITTEN ON THE FIRST PAGE. I AM GETTING READY TO SELL THIS BOOK AND WAS WONDERING IF YOU ARE INTERESTED? I AM NOT SURE OF THE VALUE BECAUSE I HAVE NOT FOUND ONE EXACTLY LIKE THIS ONE. My daughter is currently doing a 100th anniversary of Girl Scouts project and needs to find pictures of uniforms, handbooks, badges or activities the Girl Scouts performed during the decade of the 1910’s by Friday, Jan. 27th, 2012. There’s is plenty of stuff on internet but it is hard to tell for sure if it came from the 1910’s. Any assistance for us from any of you would be greatly appreciated. Thank you in advance. I have a 1940 copy of the Girl Scout Handook – 1st Impression. Value? I HAVE A 1933 GIRL SCOUT HANDBOOK FIRST IMPRESSION WHAT’S IT WORTH??? For those asking how much their book is worth, I can guarantee you that no matter the age, edition, or condition your book is not worth more than $20. If your copy means so little to you, put it up for sale on Amazon or donate it to a used book store so it can find a home with someone like me. Someone who wants to bring the tradition of Girl Scouts to the girls of today. I have the book “Handbook For Girl Scouts”, How Girls Can Help Their Country, adapted from Agnes Baden-Powell and Sir Robert Baden-Powells HAndBook 1917. Next page copyright 1917 by Juliette Low. 141 pages plus reading list page 142-152 and index page153-154. The book is the same as the picture on this page 1913 How Girls Can Help Their Country (the one on the left) The book is in very good condition, pages intact , binding very good condition, no rips or tears. The cover has a small stain and a med. stain to the left of the girl figure, but does not distract from the figure. I’am looking for value and info about it. Can send pictures a if interested. I have a 1920 “Handbook for Girl Scouts” “Officers Edition” in Excellent Condition. Anyone interested? td.hinkle@hotmail.com Thank you! Thank you for putting this together. I have been interested, as my kids have grown and i now have one in cub scouts and both in Baden Powell Svc Assn. to see how scouting literature and methods have changed over the years, for both girls and boys (the changes look to have been a lot less for BSA than GSA, so far!). There is a lot about the old/traditional that i like, and want to bring that to them at home, and teach a little more from the original perspective. Thanks! Thank you for this wonderful page. I have been interested since my sister one day asked me what I was doing every other Friday afternoon, almost 25 years ago, and I said, nothing really. She was the Captain of budget for the Los Angeles Sheriff and had every other Friday off, so, we embarked on 33 Brownies at her daughter’s private school. AND we taught a ballet class at the school on the same day! We had so much fun. One of our overnights we were offered the family mansion and estate of one of the Brownies. The family had hired a caterer to bring in tables, chairs, and their housekeeper had always wanted to be a Girl Scout, but could not afford it . She asked if she could stay and be part of the weekend. We said yes, and had our own lovely amazing one time Girl Scout who helped whenever possible, and helped the girls understand that Girl Scouting was a gift, and amazing, something not all families provided for their children. We also had many mothers who wanted to tell the girls how to do the projects, we said, NO, you can have your own project, but this is for them to learn, please do NOT help them. Or criticize them. We had seven girls go Gold, several others Silver and the careers most of our Scouts have reflect the training and love of learning of the girls in our troop. It was an interesting change from my years as a Scout leader for my sons (the first allowed in our area, their Dad had taken off and divorced us after he came home from the draft-PTSD I guess, but he said he wanted more fun than raising a family together and off he went), and after Cubs, I was allowed to be a leader, they said my sons and nephew I was raising had to drop out, because they had no Dad to be a leader. I took it to appeal, and was allowed to become a Master Scoutleader over time. I also with another on site therapeutic specialist in a lock down was paid by BSA to rewrite the entire Scouting program for locked down and probation kids, and created a Lunchtime Scouting program for kids in school who had no parent available as a leader……….I also spent four years helping parents set up their own troops……..but Girl Scouts…….a whole different experience. I would take time off using my paid vacation on Spring breaks, and summer special programs to teach at the Scouthouse in programs for three hundred or more Scouts. My Supervisor, and a friend also did the same. My sister took what time she could off from the Sheriff Department as well, it was so much fun. We have the 1933 edition, 2nd impression, same as pictured above. Ours is in slightly worse condition, however it is signed by First Lady Lou Henry Hoover, who was very involved in the development of the Girl Scouts (as I understand). This book was passed to us through family members. There are a couple of other names written in the front of the book, that we do not recognize. We find this book interesting and nostalgic, but we are curious as to whether the signature makes this book more significant or valuable. If you have any information that would be of interest to us, we would appreciate it. Thanks. I have “A Leader’s Guide to the Brownie Scout Program” first edition, 1939. Anyone interested in buying this?